The main subject of this post is the fish, so let's get the crostini out of the way, shall we? This appetizer is simple to slap together, but it does take a bit of planning since the cherry tomatoes take about 2 hours to slow roast. Just cut each tomato in half lengthwise and toss in a bowl with a bit of olive oil, salt, pepper and thyme; lay them cut side up on a baking sheet. Top each with a thin slice of garlic, and roast at 275 for 2-3 hours until they start to shrivel up and most of the moisture from the tomato is gone. Smear some goat cheese on slices of toasted baguette and top each slice with some of the tomatoes. You can drizzle a bit of balsamic glaze over the top if you like. 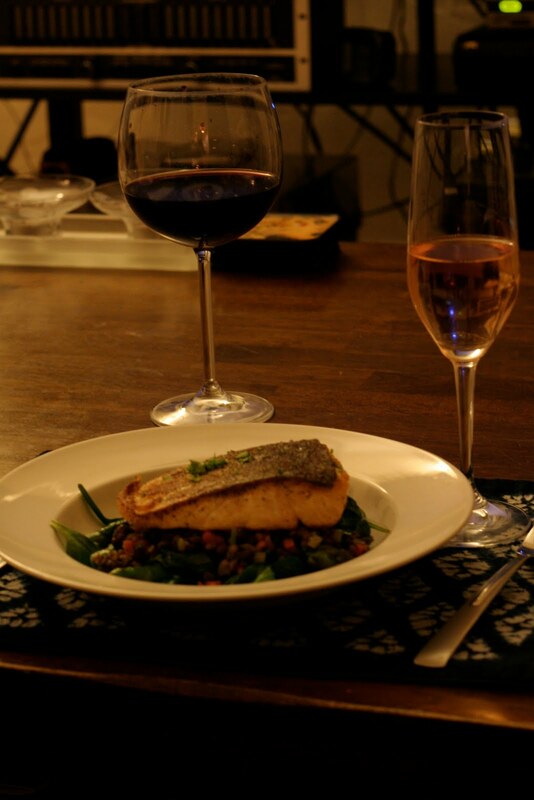 Eat with wine, or champagne, or just...eat. Ok, now on to the main event! My food-blogger-brother-from-another-mother Dylan has been telling me about McCall's Meat & Fish Company in Los Feliz for months. I've read about it on blogs and have heard they carry amazingly high-quality meat and fish, all picked and cut by the two proprietors. After reading Dylan's love letter to McCall's, I couldn't put it off any longer and made my way to the small shop on Hillhurst, and came home bearing two beautiful, perfectly trimmed and shiny pieces of arctic char. I'll add that it took me awhile to decide what to buy, since McCall's also had grass-fed Argentinian beef, gorgeous thick-cut bone-in pork chops, glimmering pearly-white sea scallops and fatty, sashimi-grade hamachi, to name a few. I felt the way Carrie Bradshaw must feel while perusing the shoe department at Barney's, although I did resist the urge to bend down and tell one particularly handsome rib-eye steak, "Hello, lover," because that would have been, um, weird. It was incredibly moist, flaky and oozing with good fish fat and the skin was basically like fish bacon- yuuumy. J and I just kind of looked at each other like, holy cow, but didn't want to stop eating in order to talk, so we just kept eating. The quality of McCall's fish is leaps and bounds higher than even that of Whole Foods, and we won't insult them by mentioning any other grocery stores since those aren't even in the same class. 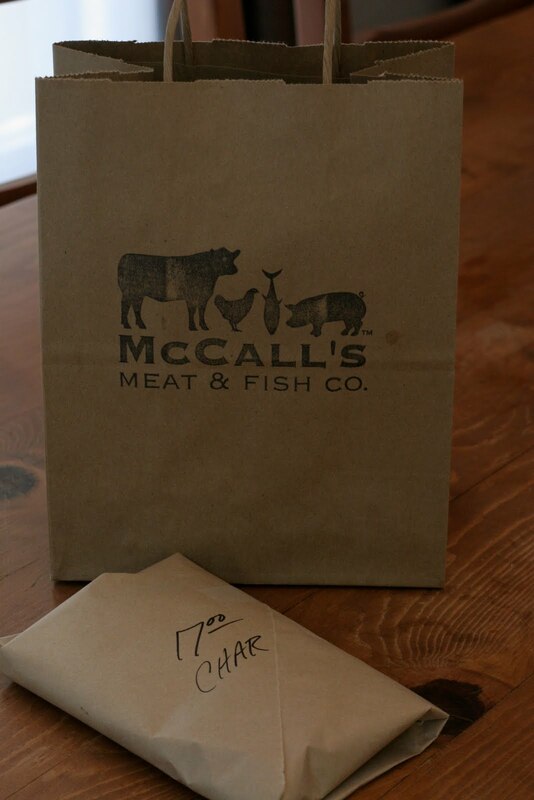 My only regret is that I didn't visit McCall's sooner and am eager to try the rest of their meat and seafood. If you haven't been yet, run and see what goodies they have today. It changes based on what's fresh and seasonal, so you know whatever you bring home will be delicious. ...now that's quite a mouthful, right? With a name like that, it has to be good. The fact that this is a Thomas Keller recipe pretty much guarantees it will be good....and maybe a bit complicated? Although the process of making this fried chicken takes about two days, it isn't difficult since most of that time is taken up by chicken soaking in brine. That doesn't require you to do anything but wait to eat this fabulous chicken. My dad's birthday and parent's anniversary fall within a day of each other, so we always celebrate the "annibirthday" as a single occasion. This year we had it at our house, since my sister moved to Ireland (read about her adventures here). I usually opt for Italian, but the recent wave of warm weather really gave me the urge to make something summery. My husband reminded me that we were barely into spring, but after a few days of 85 degree weather, it felt like summer to me! And what better to eat during the summer than fried chicken, cold tomatoes and sweet corn? Luckily our local farmer's market had some nice tomatoes, but I had to get the corn at Whole Foods since it's just a bit too early for it in the markets. I picked up a couple of whole chickens at the store, cut them up and set them in the brine. After a 12 hour nap in the fridge, it was time to take them out. Keller recommends you rinse the chicken off (a step I forgot), dry them off (done) and let them come to room temp before dredging and frying. I think this is of ultra-importance. Trying to fry (or bake, broil, pan-fry) any cold meat or fish is never a good idea because the outside cooks too quickly while the stone-cold inside remains raw. A coworker once asked me why his turkey didn't cook all the way even though he baked it for more than the required time. I immediately asked, "Did you stick it in the oven straight from the fridge?" Sure enough, he had. I think the idea of letting raw meat sit on the counter for 2-3 hours freaks people out, but you're going to cook it so it's fine, and it isn't like the meat is going to get warm. It just ensures even cooking. The dredging process was a bit messy- you dredge the chicken in the dry mix (flour, onion powder, garlic powder, paprika, cayenne, salt, pepper) and then in buttermilk, then back into the dry mixture. Although Keller says to fry immediately, I let the coating set up for 20 minutes or so. I feel this helps the coating stay on while frying and while eating it, so it doesn't come off in one, giant slab. The chicken was super flavorful- moist on the inside, crunchy on the outside. We could taste the hint of lemon that was in the brine, and the crust was so savory and crispy. 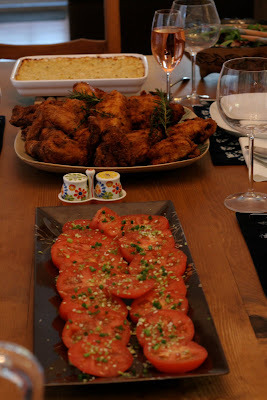 Truly the best fried chicken I've had....or made, for that matter. 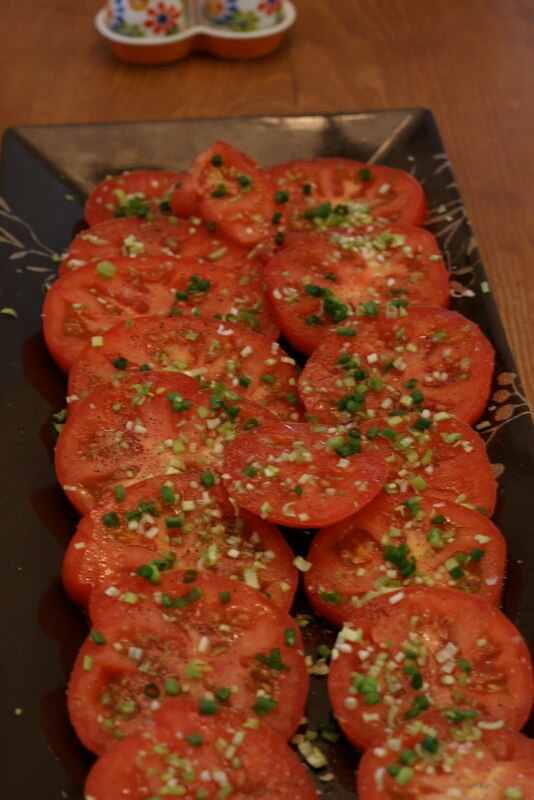 Side dish of sliced tomatoes, topped with chopped green garlic, sea salt, pepper and a drizzle of olive oil. Baked buttered corn. I saw this on Ruhlman's blog a long time ago and knew I had to try it. I realize it isn't quite the season and I had to cheat it a bit (by pulsing half of my corn mixture in the food processor to get the "corn milk" necessary to thicken the dish) but it turned out so well. This dish is SO SIMPLE but so insanely good your guests will never believe it is literally 2 ingredients- corn cut straight off the cob, and a bit of butter to dab over the top. My version had three ingredients since I added some chopped tarragon to the mixture. You just put it in a dish and bake, and it comes out like a cross between a corn pudding and creamed corn. Deeeelicious. I can't wait to make it again in late summer/early fall when the corn contains more starch. The browned edges of caramelized natural sugar is the BEST PART! I am looking forward to trying Keller's brine and coating on little nuggets of chicken breast or maybe even on some thinly pounded chicken breast, a la Milanese. Definitely a keeper. What's your favorite warm-weather food?